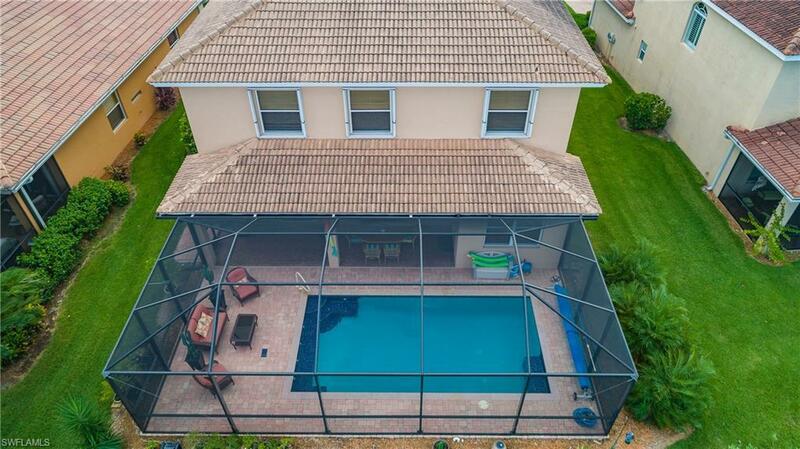 BACK ON THE MARKET - Buyer drug his feet on financing**** BELLA VIDA, Cape Coral -- Rare 4 Bedroom 3 Bath pool/spa home with over 2700 sq ft in a gated community. You will love the layout of this home featuring a beautiful kitchen with an island and pantry. Kitchen was remodeled in March of 2017 with high end cabinetry and level 4 granite. The large 1st floor Master Bedroom has two walk-in closets and master bath that includes a soaking tub, separate shower and dual sinks. This home has many beautiful upgrades including crown molding, SS appliances, extra storage area in the garage and more. There are plenty of bedrooms upstairs for family and guests. The upstairs loft is an inviting space for an office, study, cove, play area or gaming room. Relax in the serene backyard and enjoy the new pool and spa that was installed in Oct. of 2016 -- includes an electric heater and salt water system. All 2nd floor windows have accorrdian shutters. The community features a pool, basketball, volleyball + tennis courts, exercise room, play areas, ETC. Lawn care & basic cable are included in the low HOA fee. Come take a look - you will not be disappointed! Comes with a 2 year whole home warranty.